This is it, folks … the beginning of the end. There’s a magical rush in our hearts, knowing so many storylines will finally be completed before our eyes and at the same time, as we turn the knob to open that door and see what we will see, a pang of sadness inevitably strikes. As has been foretold for so very long, we wondered if it would ever really come, winter really is here. It’s the moment of hitting a final chapter in a wonderful, enveloping book we never truly want to finish. As is the preference of most grand television series these days (Breaking Bad, Mad Men), showrunners David Benioff and D.B. Weiss will prolong our anguish, cleaving the final season in half and spreading it over years, but it’s obvious from ‘Dragonstone’, the last of Game of Thrones will be worth that wait. 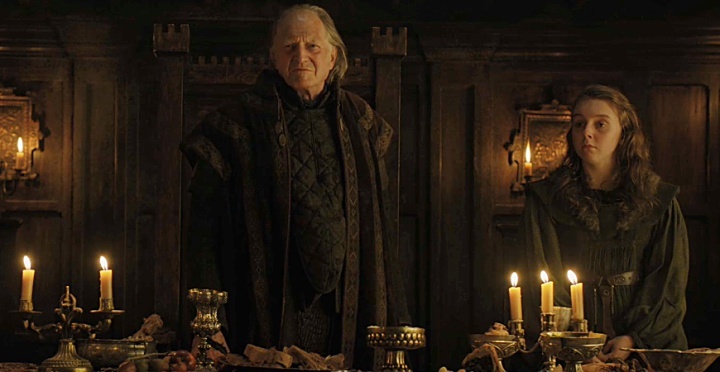 Walder Frey is dead! And yet, there he stood at the outset of “Dragonstone”, congratulating his extended family for their accomplishments and celebrating with two feasts in a single fortnight. 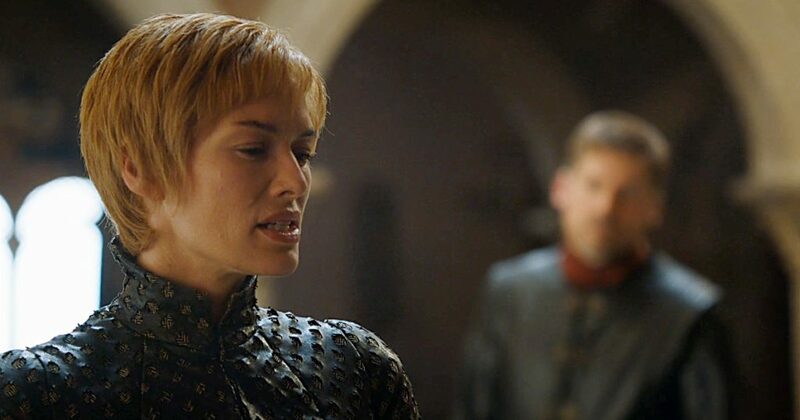 As cups are filled to gleefully toast, a joyful awareness spreads through our own wicked hearts, for we know a Stark girl shall finally take her vengeance. That almost-smiling moment of pride on Jaqen H’gar’s face when last we saw him finds its way to the audience as we watch the roomful of Freys fall. With the ominous approach of White Walkers heralded by frosty smoke and poor, turned Wun-Wun, Bran and Meera arrive at the wall, surely marking the impending disastrous fall for which no one is prepared. As Jon takes command of gathered Houses, asks the son of Umber (Harry Grasby) and daughter of Karstark (Megan Parkinson) to swear fealty, Sansa makes her public objections to the delight of the permanently be-smirked Littlefinger. The hunt for Walker-destroying Dragonglass is on, and no man, woman or child is exempt from duty. Queens and kings take their places, knights and would-be pawns fall in line as a much-deadlier-than-chess game plays out. 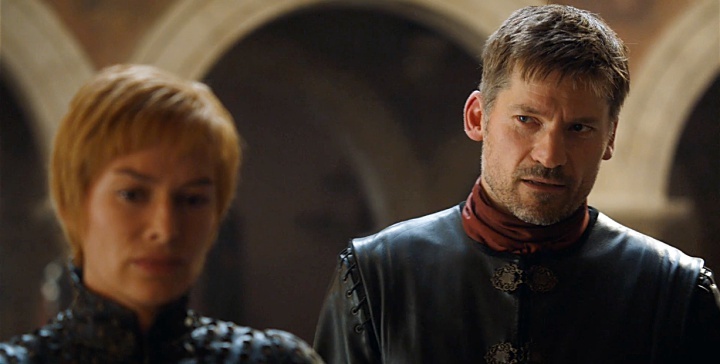 While Daenerys’ quiet arrival at her ancestral home is momentous, impressive, it is the growing unspoken chill between Cersei and her loverbrother, Jaime, father of their dead children — “A dynasty for whom?” — that leaves the heaviest imprint. 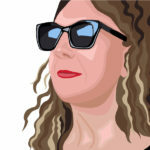 The self-proclaimed Queen of the SevenThree (“at best”) Kingdoms fears her enemies approaching from all directions, but she doesn’t appear to sense the closest danger at hand. *See Deep Thoughts notes about Hands of Gold below. Boring Sam takes a turn for the interesting when his hilarious and vomitous (the looping bedpans to food bowls shots almost made me ill as well) daily grind leads to two intriguing revelations: Ser Jorah is also within the Citadel (hopefully having his Greyscale treated) and, after Sam locates his cojones and steals keys to the restricted area — and a few books — discovers there’s a hidden trove of Dragonglass at Dragonstone. 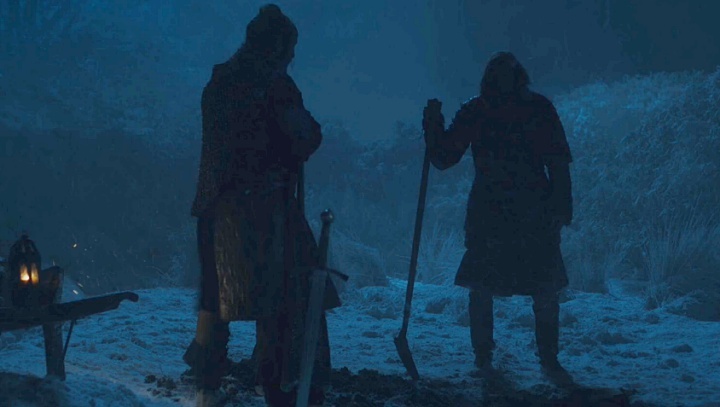 Of moving moments (that stir worry over the possibility of a crushing CleganeBowl), the Hound is revealed as opposite his Mountainous other as a brother can be. Returning with Beric and Thoros to a home that’s somberly familiar to Sandor, the group takes shelter in the home of a deceased man and child. Invited to look closer into the (terrifying to the Hound) fire, he does indeed see something(s) coming, the wintry, deadly Walkers passing the wall and what sounds like Eastwatch-by-the-Sea, which is exactly where Jon sent Tormund to stand watch. As the Hound does his best to make reparations for sins past, the certainty of winter and war takes hold. 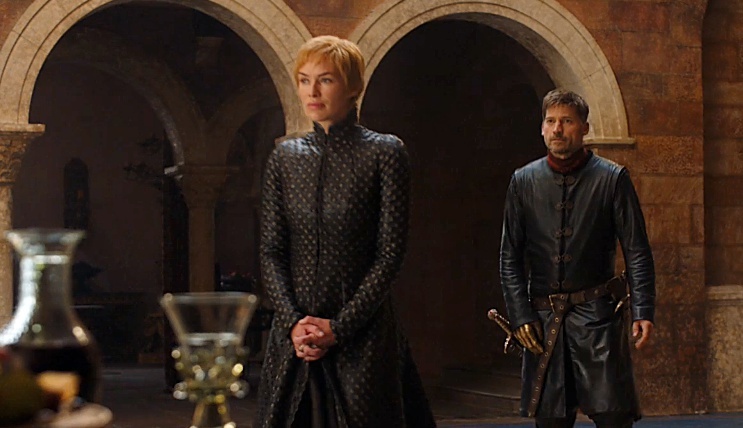 For, as heralded by this season opener, Game of Thrones‘ dreary, fantastical world ruled by murder will clearly deliver more death and destruction, but the hope for something better beyond the darkness. 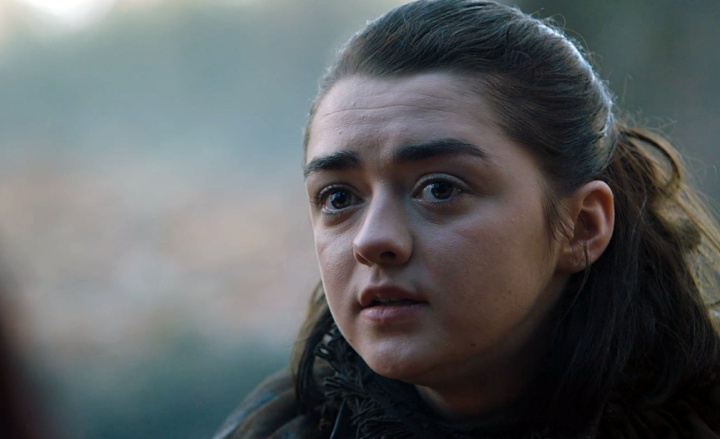 Why did we hear that particular song sung by Ed Sheeran (unidentified character) to Arya in last night’s premiere? 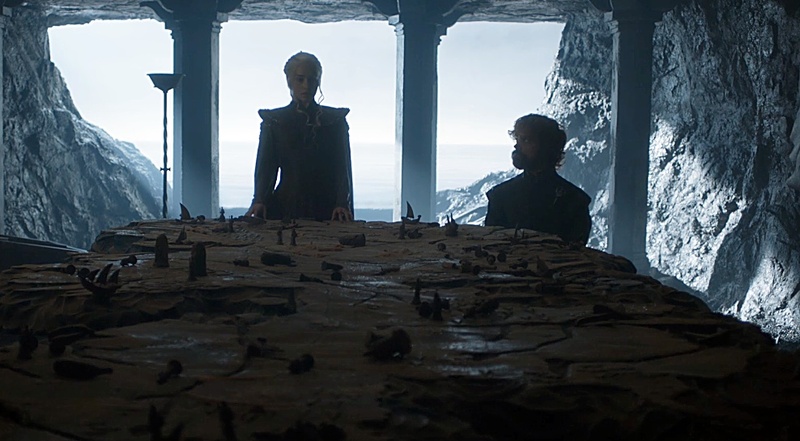 Surely Jon’s comment to a roomful of Houses that “The only thing standing between us and the dead is the wall” also foreshadows the wall’s fall (or failing). The magical spells that keeps the White Walkers from passing will be broken now that Bran has entered; his connection to the Night King in a vision last season will allow him to find Bran again. We could practically feel the cold in our own bones as the White Walkers emerged from a smoky fog-covered frozen tundra. Heartbreakingly … Wun-Wun among them. 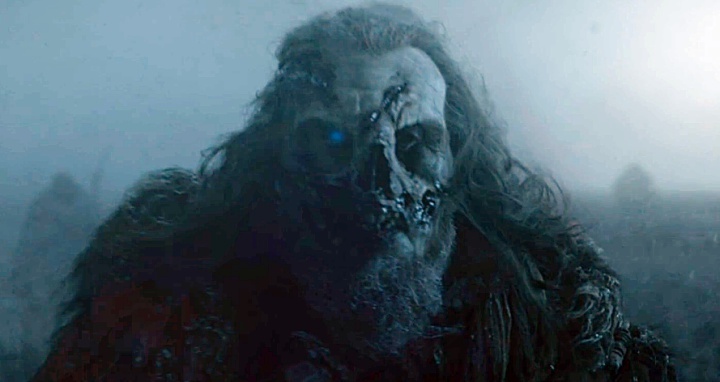 (I realize there are questions about how he might have gotten to the group from Winterfell, but it seems too coincidental that this giant was missing an eye and the actor is credited on IMDB.) It could be that scene was purely Bran’s vision, and possibly even what the Hound saw in the fire. Great turn (as always) by Jim Broadbent as the pragmatic Archmaester Ebrose. Rory McCann was at his very best as The Hound this hour. It’s been our absolute pleasure to watch his evolution. Despite his ruthlessness, there’s always been a visibly soft underneath peeking through, and we’ve finally seen it fully exposed. I’m going to lose it if that despicable, used-to-be-brother kills our dog, but something tells me The Hound is going to have a glorious, victorious CleganeBowl. Shall we begin, indeed. Overall, a glorious start to the seventh season, as directed by Jeremy Podeswa (Home, The Red Woman, Unbowed, Unbent, Unbroken, Kill the Boy). 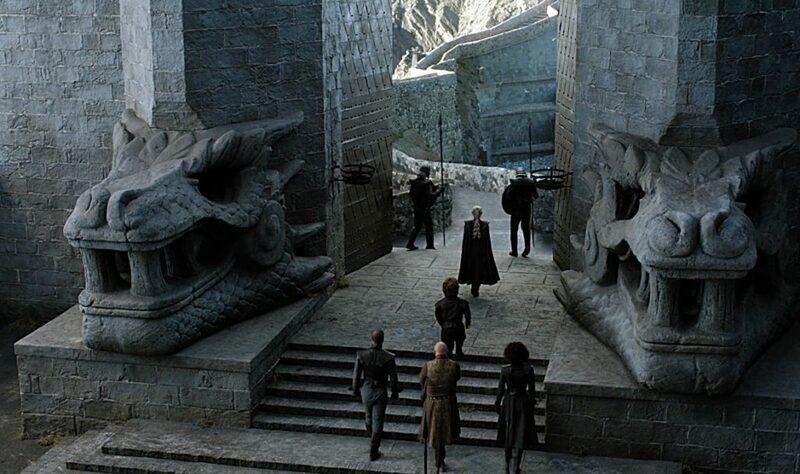 The shots of Dragonstone, its gates and doors, were stunning. Pilou Asbæk had a blast with his proposal scene, his dark side at least comical for now, though hints of what’s yet to come with Euron Greyjoy peeked through. Lyanna Mormont kills it again. What a great young actress, that Bella Ramsey. Torienne (Tormund x Brienne), Part the Second! We thank you, benevolent showrunner gods. Next story 2017 Emmy Awards: Who is Going to Win These Things Anyway?